American Family Association (AFA) and American Family Radio (AFR) are partnering with Eric Horner Ministries in an outreach to our military called “Operation Tank Full of Love”. The mission of Operation Tank Full of Love is simply a way for the body of Christ to be the hands and feet of Jesus to those who defend our freedom. Since its inception in 2010, more than 12,000 soldiers have received the gift of free gas and the Gospel as God's people have provided almost $300,000 to make it happen. It's a way to do something that really contributes to the overall wellness of our military families both financially and spiritually. It's a great source of encouragement to them as they carry out their calling of insuring liberty. Click here to donate. 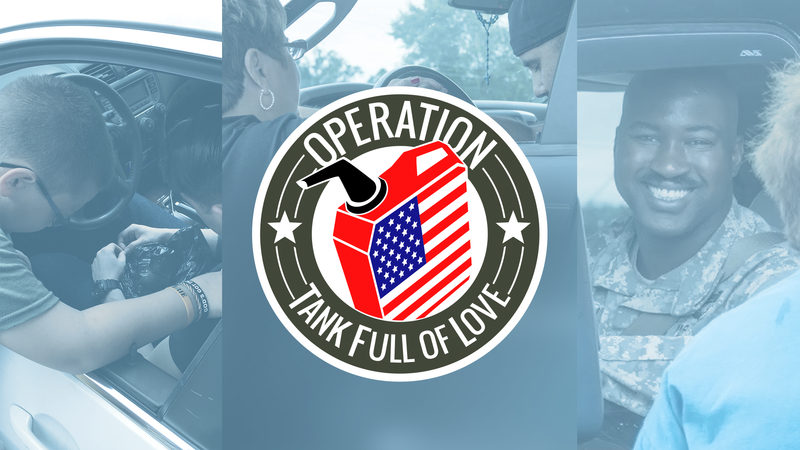 Operation Tank Full of Love happens every September in Oak Grove, Kentucky, just down the street from Ft. Campbell. This year’s event will be on Saturday September 22nd. The soldiers serving at Ft. Campbell deploy all over the world and they are able to take the love and appreciation they receive at Operation Tank Full of Love with them wherever they go. It's a ministry that literally goes out on a worldwide scale. There are many ways to be involved in Operation Tank Full of Love, from giving to volunteering to being a prayer partner for each event. Each year 100 plus volunteers come from churches within a hundred mile radius of Ft. Campbell as well as from across the country. Some volunteers come from as far away as South Fla, South Texas and the Carolinas. It's always awesome to watch the people of God come together with the common goal of reaching out to our military heroes in His name. We hope you will consider partnering with us in this effort. If you'd like to donate, you can do so below. One hundred percent of funding that comes in goes right back to our soldiers. We hope you will prayerfully consider being a part of Operation Tank Full of Love! Operation Tank Full of Love is simply a way to say thank you to those who serve by providing them with the gift of free gas. These events have been done for 8 years in a row at Ft Campbell KY. It's been amazing to watch God grow our efforts from $8,800 of free gas the first year to as much as $60,000 in recent years. We are preparing for our 7th annual Operation Tank Full of Love at Ft. Campbell to be held on Saturday, September 22. We would like to invite you to partner with us in blessing our men and women serving there and their families. If you'd like to be a part of this endeavor there are several ways to do so. The best ways are to call Eric Horner Ministries and make a donation by phone at 877-968-3742 or you can make a donation through the Operation Tank Full of Love web page. Click here to donate. You can also send your donation by mail to Eric Horner Ministries, P.O. Box 281, Gladeville, TN 37071. Please note on your check that it is for Tank Full of Love. All donations are tax deductible and need to be in no later than Sept 22 in order to be used at this year’s event. We hope you'll prayerfully consider being a part of Operation Tank Full of Love 2018 and most importantly we hope you'll remember to pray for all who serve daily. We owe them a great debt of gratitude.